A tortilla wrap sandwich filled with a tasty ingredients is a change of pace from traditional bread sandwiches. Depending on the filling, these versatile sandwiches are suitable for breakfast, lunch or dinner. However, wrapping the tortilla into a neat shape is tricky, and the filling often escapes, ending up on the plate or even worse, your lap. If you master the simple process of creating secure, neatly folded wraps, your filling will stay where it belongs. 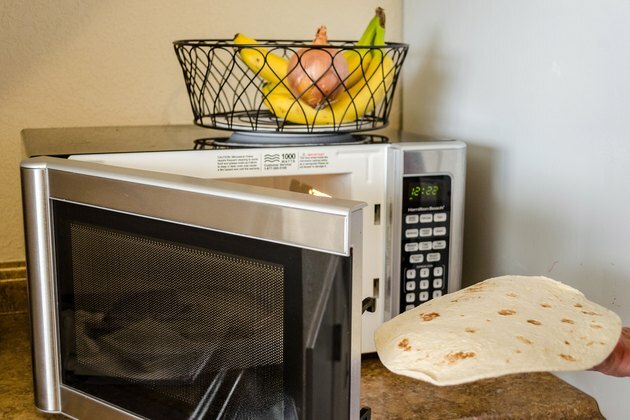 Stack tortillas between damp paper towels and heat them in the microwave for about 20 seconds. 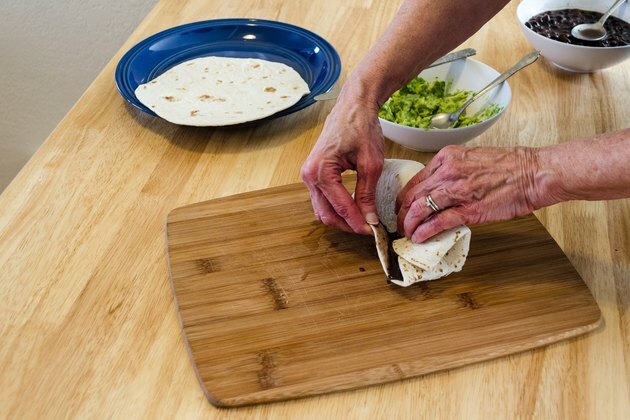 Warm tortillas are more pliable, easier to roll and less likely to tear. 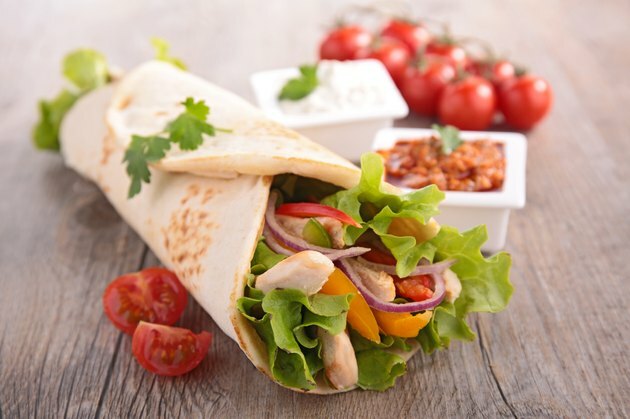 Cover the tortilla with a thin layer of your choice of spread, such as mayonnaise, salad dressing or hummus. 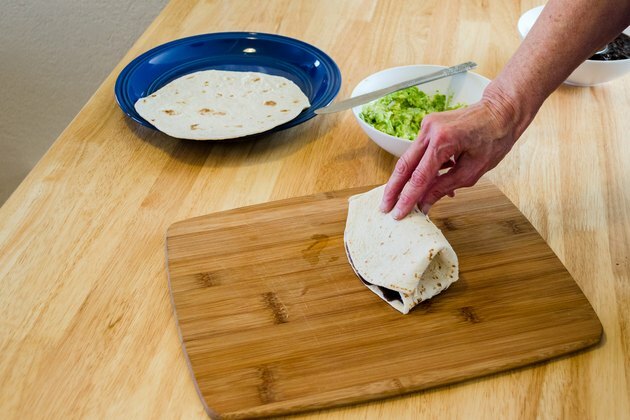 Extend the spread evenly to about 1 inch from the edges of the tortilla. Although spread is optional, it works as an adhesive and helps hold the wrap together. Spoon your choice of filling in the center of the tortilla, but don't overfill. One to two tablespoons is usually enough, depending on the size of the tortilla. Fold one side of the wrap over the filling and towards the center if you want a wrap with one end open. Fold both sides over the filling and towards the center if you prefer a wrap with both ends closed. How far to fold the edges towards the center depends on your preferences, the size of the tortilla and the amount of filling. As a general rule, fold enough of the sides to hold the filling in place, but not so much that the two edges overlap in the center. 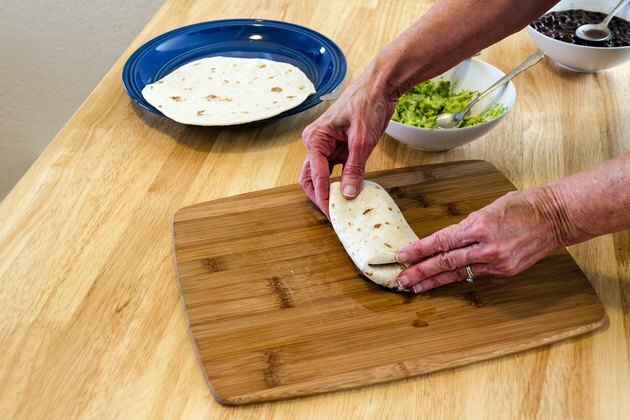 Roll the tortilla, beginning with the bottom of the tortilla and rolling carefully to the top. 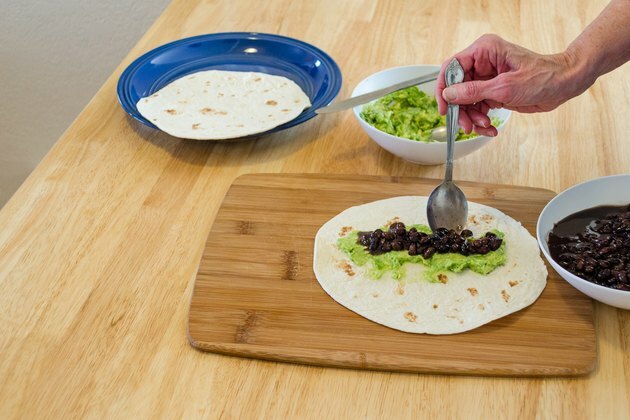 Hold the folded sides of the wrap in place with your fingers as you roll. 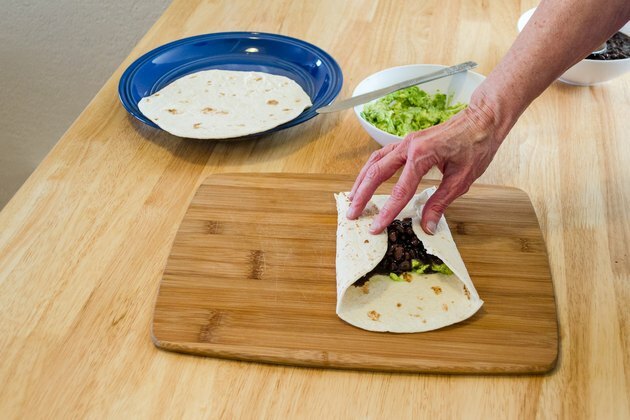 Place the wrap sandwich on a plate with the seam facing down. Eat the wrap immediately or wrap it in aluminum foil or plastic wrap and place it in the refrigerator for one to two hours before serving. Flour tortillas are best for sandwich wraps. Corn tortillas tend to tear and split because they are drier. How do I Make Taco Salad Bowls From Tortillas?